SEAL-ONCE® Multi-Surface Concentrate deeply penetrates the surface to protect and stabilize wood, concrete and masonry against water damage and decay. It uses proprietary nanotechnology to create a long-lasting, flexible, breathable barrier to provide protection from the inside out. Multi-Surface Concentrate is diluted 1:1 with clean water to create the final, usable formula. It protects against warping, cupping, cracking, spalling, rot and decay. It also prevents mold, mildew and fungi growth. Multi-Surface Concentrate is non-yellowing and will not alter the original appearance of the wood, concrete or masonry. It allows wood to silver naturally over time, and can also be mixed with any of our available Semi-Transparent Tints for Wood to enhance the appearance of your project. Remove all old coatings, dust, debris and loose material. Remove oil, grease, algae, grime, mill glaze and mold and mildew stains with appropriate cleaners. Recommend SEAL-ONCE All Wood Cleaner or SEAL-ONCE Concrete/Masonry Cleaner. Test absorbency after cleaning by sprinkling water on surface. If the water does not readily penetrate the surface, stripping will be necessary to remove old coatings before applying SEAL-ONCE Multi-Surface Concentrate. When applying in direct sunlight and wood surface is hot, spray with a mist of water and apply Multi-Surface Concentrate immediately on dampened surface. Substrate can be painted or stained as soon as it dries in approximately 2-3 hours. Surfaces that have been treated with Multi-Surface Concentrate can be cleaned using a mixture of 1-gallon warm water, 14 oz. bleach, and 1 oz. of Dawn® dish detergent. Apply this cleaning solution with a sprayer and allow to sit for 20 to 30 minutes on the wood surface before rinsing with water using a garden hose with a nozzle. 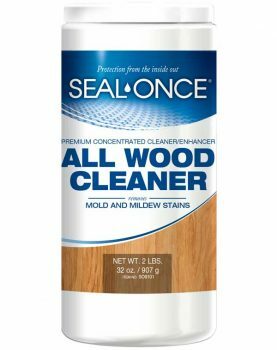 This cleaning solution can be used to remove airborne mold and mildew stains, dirt and grime from the wood surface. Multi-Surface Concentrate will prevent and resist any water, mold and mildew penetration. Do not use oxidizers, corrosives, or strippers on surfaces that have been treated with Multi-Surface Concentrate. Surfaces can be recoated with Multi-Surface Concentrate at any time. Multi-Surface Concentrate may need to be reapplied for fading tint color, surface damage, in heavily worn or high traffic areas, or in places where the surface may have undergone noticeable changes. Before reapplying Multi-Surface Concentrate, clean the surface using the recommended cleaning solution above. Apply Multi-Surface Concentrate according to package instructions. When reapplying in small areas, lightly overlap onto areas previously treated with Multi-Surface Concentrate.